The Freckled Fox: Double Winner - High Heel Giveaway! 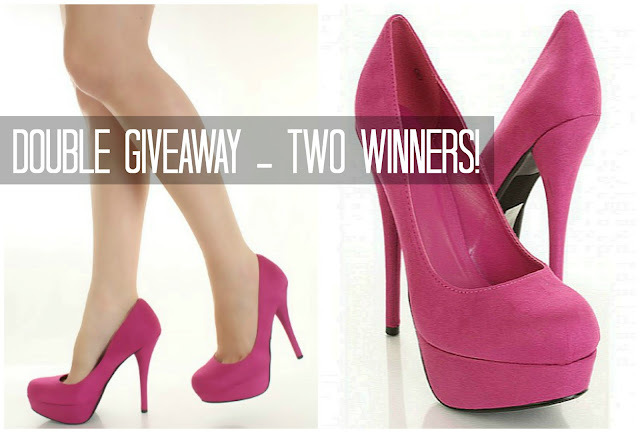 Double Winner - High Heel Giveaway! These are so simply chic and easy to pair with just about any outfit, and who can't use a pair of fabulous pink high heels in their closet, especially if they get them for free?! Thanks for all your support of me and my blog, really! Thanks also for stopping by, and good luck with the giveaway! I own one pair of black heels, and have been far to scared to try and buy another pair. But these are REALLY cute! Love it! Hope it would be international! Oooh, can't wait to see if I win! 8.5, date night with the mister! Gah! These are amazing shoes! Do the shoes run big at all? I usually wear a 7. I would seriously wear these everywhere. I'm wearing 38 europe size and I think it's 5.5 US? Lovely shoes! THESE SHOES ARE SO CUTE!!! Fingers crossed! I wear a size 6.5 and would wear these...everywhere?? Is that an answer? lol I would love to have them to wear when I go to the beach this summer! (obviously not ON the beach, but for a nice dinner or a short walk up and down the boardwalk!) Thanks for the giveaway! I wear a size 6! I would definitely wear them on a date. I need some good heels! I wear a size 9.5 for heels. LOVE these shoes and would wear them with my dark skinnies and a floaty top - out for happy hour with my girlfriends. They would be envious! I'm a size 8 and would wear these shoes anywhere, even the grocery store - why not?? I'm a 6.5 and I'd wear these shoes to work or out to drinks and karaoke with my girlfriends. Or around the house just because I want to feel fabulous. I would definitely wear them for a night out with the girls! They would look gorgeous with nice jeans or a skirt! I'm a size 6. And I would wear them every chanceI got! I wear size 6 and would wear these every chance I got! I'm a size 7 and would wear these everywhere! I wear a size 5. I have tiny feet and I hope that that size is available =) I'd wear them whenever I'm in the color pink mood. And I would wear them everywhere! I'm a UK 6, which is a US 8 I believe! Thanks for the FAB competition! love your blog, love these shoes! I'm a size 6 and I would wear these to an upcoming bachelorette party! I am a size 11 and i would rock these across the stage as I graduate from nursing school!! I wear a size 7.5, and I would wear them out on dinner "dates" with my husband! size 7 and I would wear them first to an upcoming wedding. I wear a size 8.5 and I would wear them to my bridal shower. I'm from Portugal, and my size is 38. I don't know how to convert, sorry :( i would wear them on a party of my group of friends :) Keep the good job with your blog! I'm a size 9, and I would wear them to my upcoming formal! Those heels look absolutely amazing and definite would be amazing pop of color for the summer. ahh.... those shoes are absolutely amazing and they would be an great pop of color for any outfit in the summer. I'm a size 8 and would love to wear these on a date with my husband! Size 7.5 and I would wear them to my sisters bachelorette party! My size is 5,5 / 6 I would wear them at a party or my niece's wedding! I wear size 8 1/2 and I would wear these to a wedding with a black dress. I'm a size 6.5 and would love these for going out to dinner with my husband. Thanks for the chance to win! I love the colour! I'm a size uk 4 and I would wear them to my cousin's wedding! I'm a size 9 :) I'd wear them for a dinner date!! They're too cute, thanks for the great giveaway! size 7.. to a club! I'd need a size 8,5 - and I'd wear them to my friend's wedding in June! I'm a shoe size 9.5. I'd wear them to dinner with my black and white striped pencil skirt! would love, love, love these shoes in size 8.5 and wearing them to a wedding w/my cream lace skirt. I wear a 10 and I would wear these to my cousin's wedding! I'd wear them to the wedding I'm playing piano for with the floral dress I've got. I'm a US size 6.5 and would love to wear these for a girls night out!